There is Daylight Savings Time and there is Horseshoe Time. Coming from the south still on US19N. I dry camped in a truck stop last night. Learning to slow down and enjoy the ride I found myself taking a left off the highway to discover something new. I will forever be looking for that "Yankeetown Experince", tho. This mornings left turn brought me to Horseshoe Beach. It's an Island. It look like the suburbs of Key West. 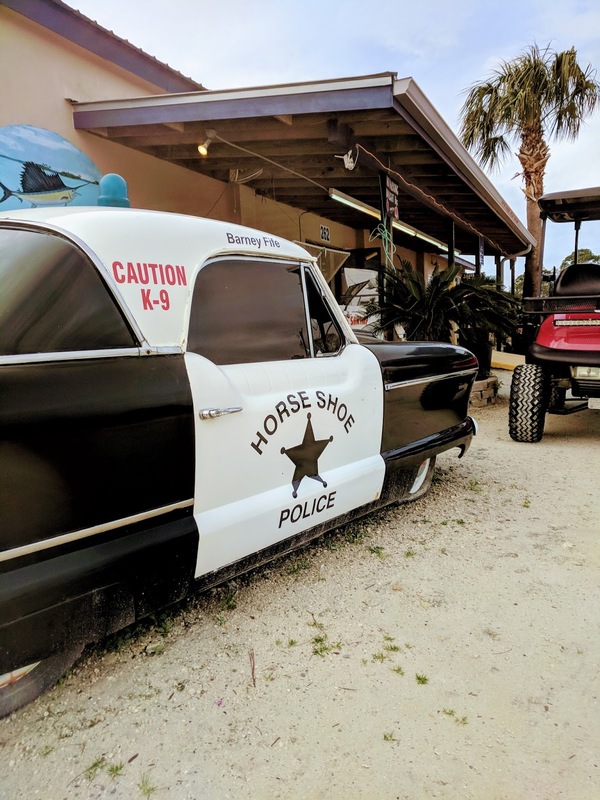 The Dixie County timberlands guide you through and too Horseshow Beach. There isn't much along the way from US19 but when your are here, you arrive and you know it. I was impressed with all the signage. The couple businesses that are here really sock it to ya coming in. Almost like arriving in Vegas or any other tourist driven spot. 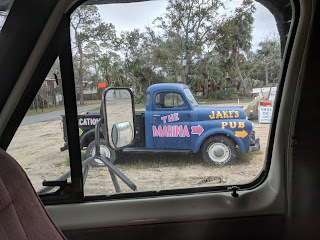 Signs for the Marina, LIVE Bait, Rentals, Jake's Pub and I think I saw a Post Office sign. I look for those for my friends Lisa H and Cindy L back home. Anyway. I drove to the end of the road just to see where it goes. Well it went to the end. I posted a video this morning on social media and my friend Pocahontas said it looked lonely and she suggested that I "Get out of there". I was heading back out and now I was able to look at the little island a little harder. 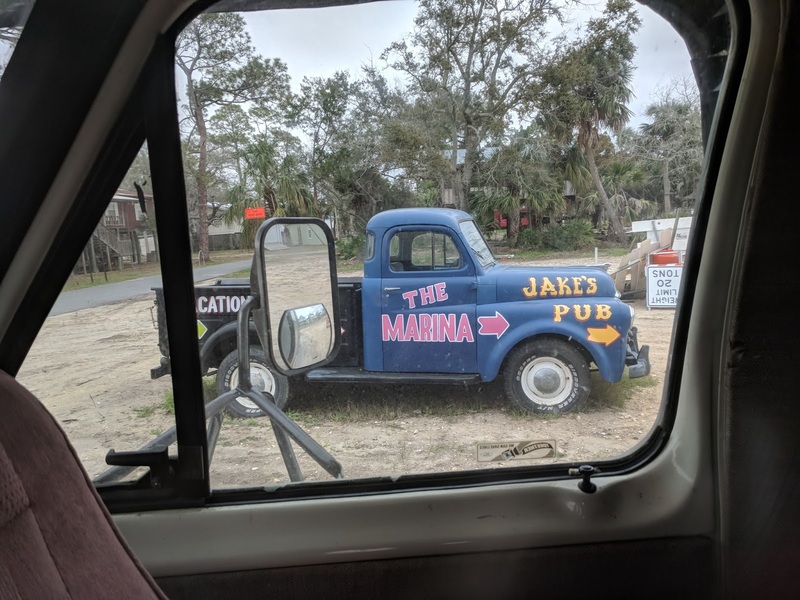 I noticed the marina on my right and I was able to get the Wander Wagon in so I followed the many unnecessary signs to Jake's Pub and The Marina. Turn Left at the Blue Truck! I am so glad I did. I was able to grab and complimentary shower from Louis & Dennis Buckley. Mr. Buckley was on the only one around when I arrived. 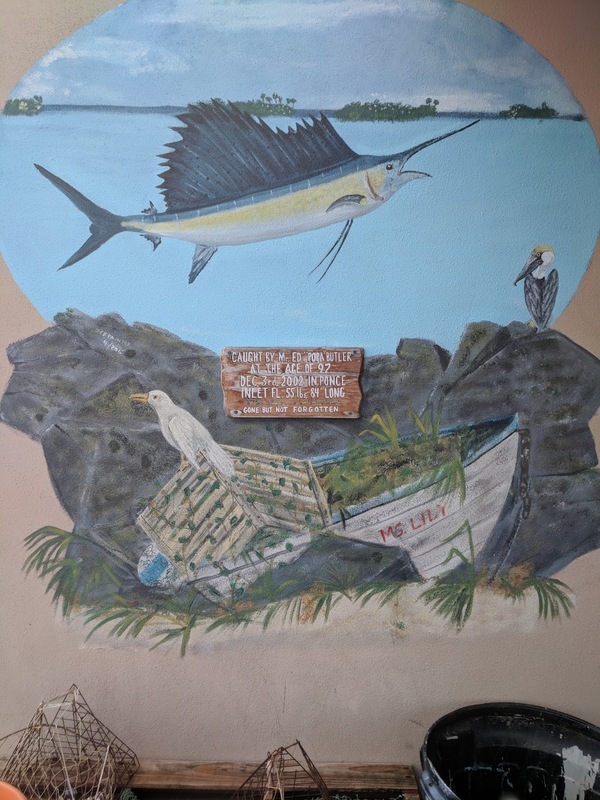 I was able to find out from him that Horseshoe Island was very prideful of their history and the story about it is very colorful. Mr. Buckley had an odd way, to me, to describe the population. They have about 400 water meters and only 200 of them run full time. The other 200 are seasonal or rentals in the area. 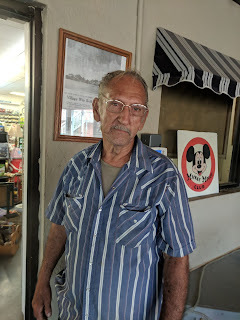 Mr. Buckley was actually in the rental business before him and Mrs. Buckley purchased The Marina. I am sure that MR & MRs Buckley paid a slight bit more than the $10 per lot the original "Squatters" paid when they refused to leave the land back when the founding fathers bought the community for $400 from a lumber company. This part of the story reminded me of Hurb Clabough who lives at the foot of the mountains back in Gatlinburg Tennessee when he once told me the story that his family was there and placed by the Champion Paper Mill to protect the lumber there in the Smokies. A news paper article from the 20's or 30's hung on the wall just inside Jake's Pub. Jake was Mr & Mrs Buckley's dog. Jake's Pub is open on Friday and Saturday nights and Mrs. Buckley told me that they have "LIVE" Country Music. Listening closer it sounds like they have a real good time here especially last Saturday night, it was a full house. Salt was one of the first harvest that come from the area and the news articale that was published by the Times-Union that I referred to seems to be speaking of the tranition from salt and a cash crop to fishing as a cash crop for this little island community. I would suggest a little time here just for peace and re-grouping if anything else. Everyone here seems to be pleasant and glad you are here. There are a few old timers walking around that at first you think they are grumpy but I guess it's just bad gas or not enough fiber, they smile-ish and wave when you speak to them. When you come you might wanna think about stay in Mr & Mrs Buckley's rental. It's called Dolphins Crossing. The Buckley's lived there before purchasing the marina. They tell me that 5 Dolphins come in with the tide daily and cross by this peaceful retreat. IF you bring your RV or Tent they have a few RV camping site at the marina. 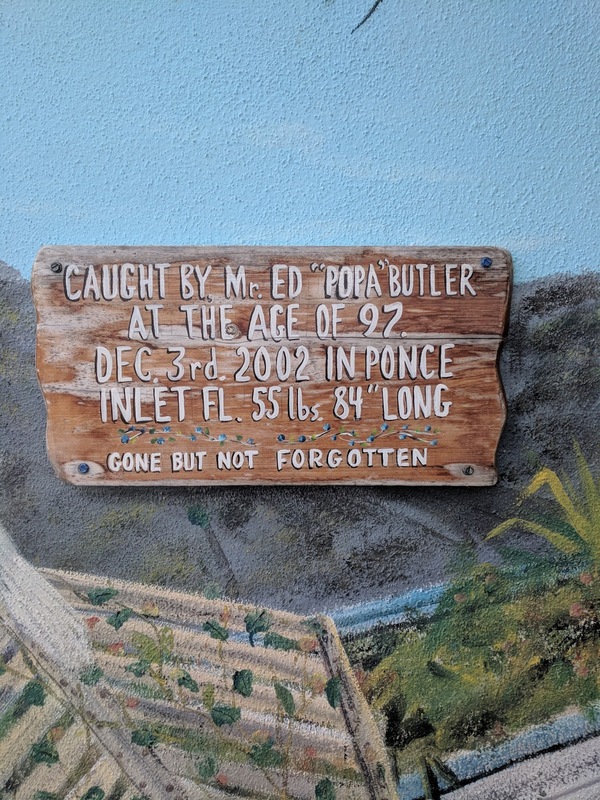 When you come you will meet a handful of characters and here of Pappa Butler one of the founding fathers descendants. You will more than likely meet Pork-Chop. 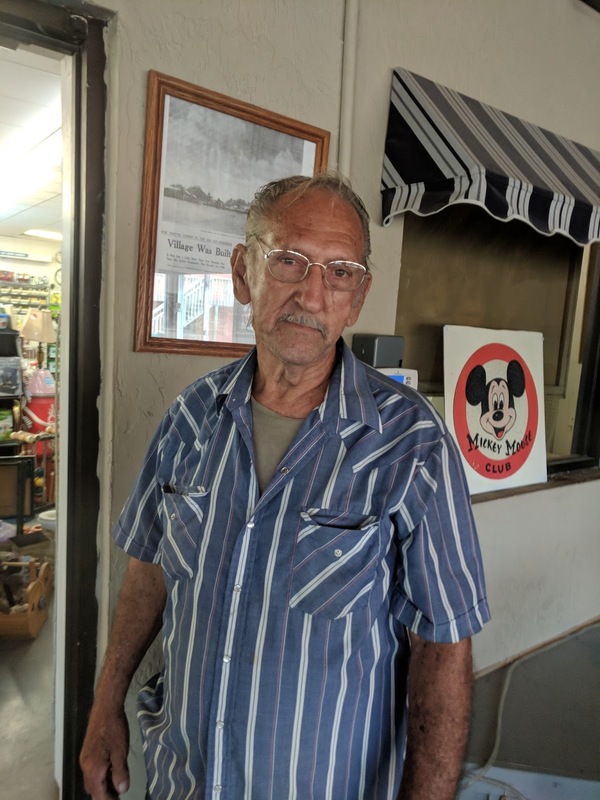 I heard Mrs. Buckley call him "Chop" He has been around 73 ish year minus a few to go work for the state in traffic control for a great retirement. He said it was so great that he is still working. He use to get off the school bus when he was a kid and help build a place beside the Dolphin Crossing that use to be the original Fish House here, anyway. Mr. Pork-Chop said that he helped build the Crimson Crest and now after it being Beer Joints and Thrift Stores and a target for the storm of 1993 he is also tearing it down. So when you visit, depending on the tide there is plenty of wild life to see even Bald Headed Eagles sayed Pork-Chop. I know one thing there are plenty of stories to hear if you just stop long enough to listen.